From the Eisner Award-winning team of writer Brian Michael Bendis and artist Michael Avon Oeming comes a superhero noir crime drama set in a world where superheroes are real! 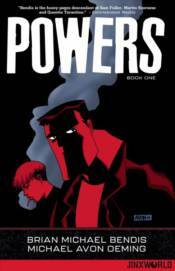 POWERS: BOOK ONE re-collects issues #1-11 of the original groundbreaking series with an extensive behind-the-scenes section about the creation of the series In a world where heroes soar through the sky, detectives Christian Walker and Deena Pilgrim deal with special cases that include powers. But what is a cop's job like in a world where powers are par for the course? The shocking murder of America's sweetheart, Retro Girl, has the world in mourning. The murder investigation takes Walker and Pilgrim from the city's seedy underbelly to the gleaming towers that are home to immortal beings. As shocking truths about Retro Girl come to light, Walker finds that to solve this crime, he might have to reveal his own dark secret.